When I was a little girl Thanksgiving was one of my favorite days-right up there with Christmas. 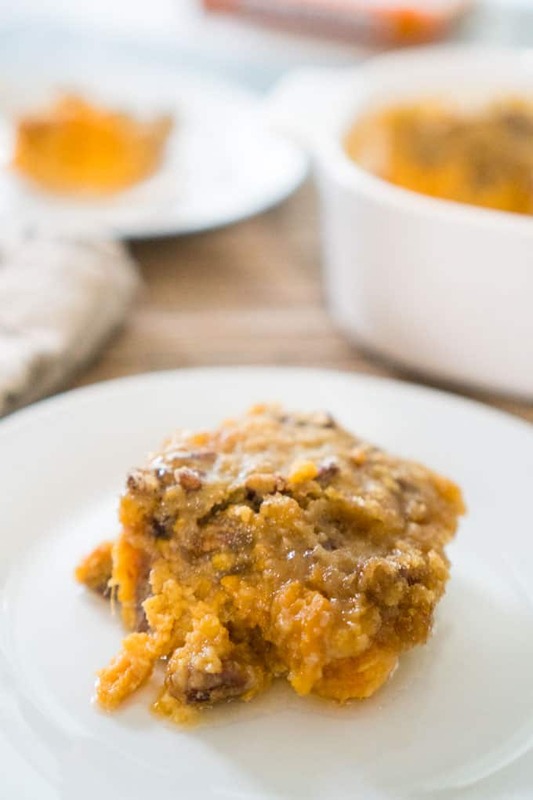 It was a magical day full of all of my favorite foods-stuffing, turkey, and of course, her classic sweet potato casserole recipe. My grandma made it just the way I liked it-marshmallows toasted golden on top. It was perfection. 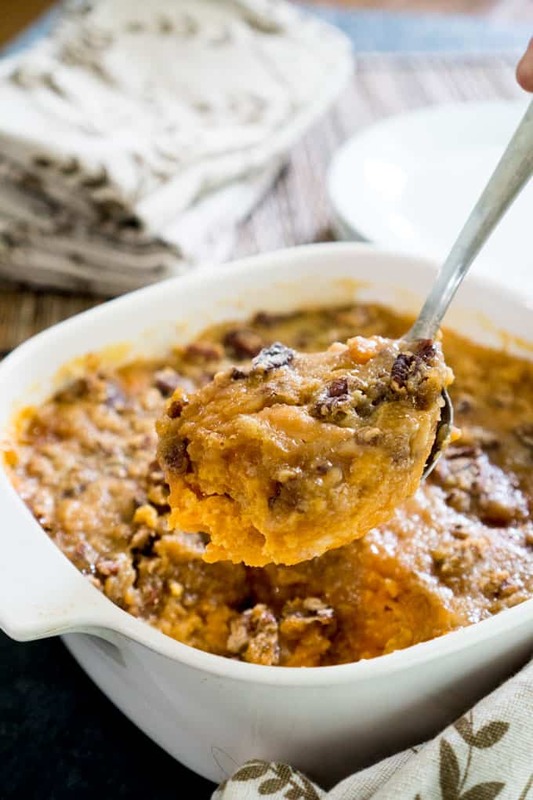 Today I’m going to let you in on the recipe that rocked my Thanksgiving world! 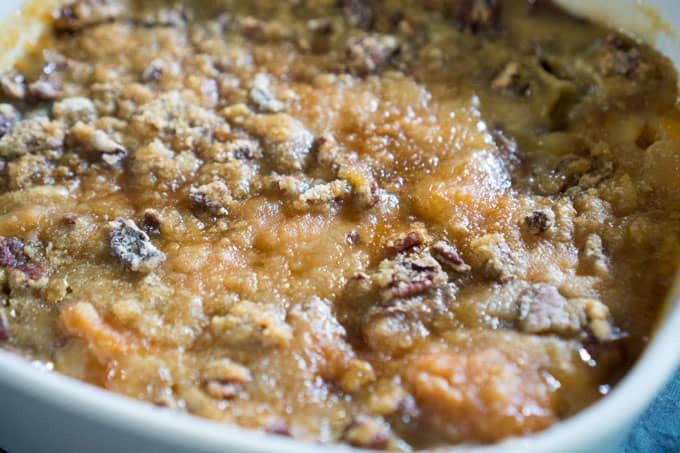 Unbelievable sweet potato casserole with a crumbly buttery brown sugar and pecan topping. 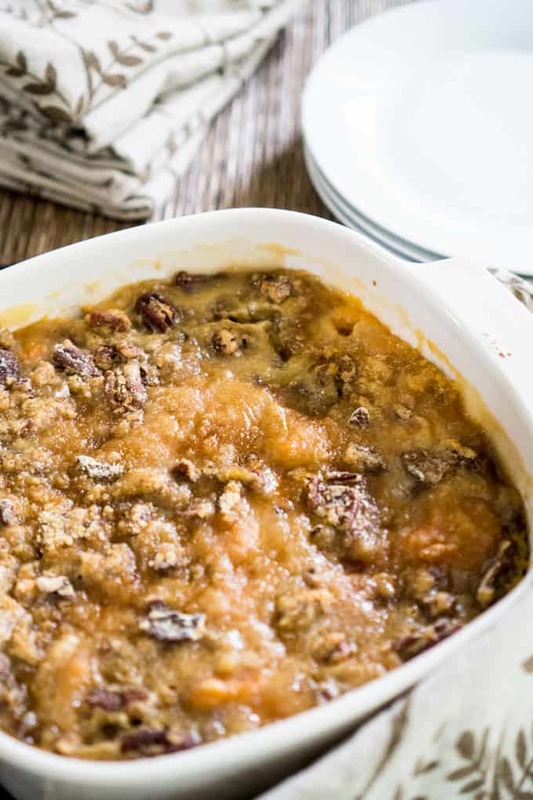 This is one Thanksgiving or holiday dessert recipe you won’t want to miss! Add granulated sugar, milk, egg, 3 tablespoons of butter, and vanilla. Mix until thoroughly blended. In a smaller bowl combine brown sugar, flour, 2 tablespoons of butter and mash with a fork until crumbly. Stir in pecans. Pour yam mixture into an 8 by 8-inch baking dish. Top with brown sugar mixture. Bake for 25-35 minutes or until top is golden brown and bubbling. How is that for a scrum-delicious Thanksgiving veggie dish? Happy Thanksgiving!! This looks like the recipe my mil makes! And I agree, much better than the marshmallow version! And on the Country Crock site – I’m going to try the grilled cheese thing for my kids school lunches! I love Roasted Cauliflower, but I am looking forward to trying the Cranberry-Orange Spiced Green Beans and Spoonable Corn Bread! 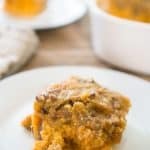 I think I was supposed to put this in the RC, but here goes: I love the idea of the “Spoonable Cornbread” = my Husband always loves Corn cassarole, but no one else does! We will try this out this year, & see how it goes…. Thanks Country Crock website!!! (And we’re trying that Sweet Potatoe one above, too – yum!!!) Thanks for the chance….